Kurt presented with Gynecomastia of his chest. Then around the mid-section, he accumulated some extra fat that we all can have happen as we get older. Men tend to be less quick to seek out solutions than women. But when they do, the results are often transformative. He and I talk about the problems and solutions in this video. His story is inspiring, and it really illustrates the change in men’s attitudes towards talking about their concerns and then having plastic surgery to solve them. 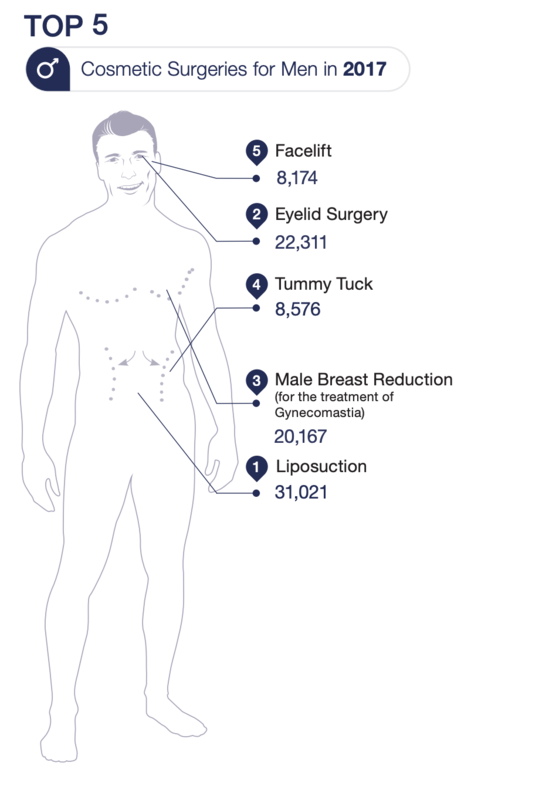 More men are turning to plastic surgery than ever before. Just as Kurt did, you don’t have to put up with things you don’t like about how you look. Tell us what you want to change, because it’s not just about fixing something; it’s also about your being happy! 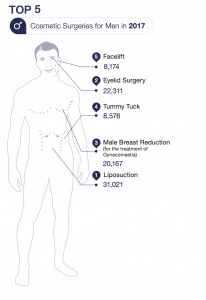 Check out these findings—According to the American Society for Aesthetic Plastic Surgery (shown in the diagram on the left), the top five cosmetic surgeries for men in 2017 were (1) Liposuction; (2) Eyelid Surgery; (3) Male Breast Reduction/ Gynecomastia; (4) Tummy Tuck; and (5) Facelift. We are seeing this trend continue with more men requesting these procedures. Additionally, several of my male patients want body augmentation of their chest, calves or buttock. For those of you who have lost a lot of weight or are seeing their former selves heading south, a body lift may be just the ticket to bring things back in place. These are not your wife/girlfriend/mother/sister procedures modified; they are tailored services specifically designed to meet the needs of men. Noticing lines or age-associated wrinkles just starting to appear? Do you already have firmly established wrinkles or larger lines on your face giving you a tired appearance? Worry not! Injectables and fillers can help give you a natural, rejuvenated, fresh, and more rested appearance. Hate that double chin? Growing a beard is one option for hiding it. But, I have two more permanent nonsurgical solutions: Kybella™ injectable, and CoolSculpting© to freeze it away! Speaking of CoolSculpting, it’s great when you need a touch of fine tuning to freeze away unwanted fat without surgery or downtime. This fantastic FDA-cleared technique keeps expanding approved treatment areas. Currently, we are treating back fat, belly fat, love handles, thighs, and arms. Imagine how you can fine tune your bod! Sublative & Sublime: These two in-office, facial treatments use radio frequency to help reverse multiple signs of aging and increase skin tone and quality. These procedures help you look years younger without surgery, fillers or toxins.